For Elvis fans who might not be aware, Rick Nelson first broke onto the national scene as one of the stars of The Adventures of Ozzie and Harriet, a US sitcom based on his actual family. By the time he was seventeen, Rick's musical idol, Elvis Presley, was taking the nation by storm, so Rick decided that he also wanted to be a rock and roll star. 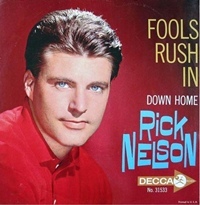 Fifty-three Rick Nelson singles reached the Billboard Pop 100 chart. Rick had his greatest success between 1957 and 1963, and during those years he was second only to Elvis Presley, an amazing achievement. While the majority of fans only recall James Burton's work with Elvis, it is appropriate that the 25th anniversary of Rick Nelson’s death turn the spotlight back to James’ early collaboration with one of his best friends. In fact, the two musicians lived in Rick’s parents’ home for two years. This interview is primarily about James Burton's earlier career with Ricky Nelson - however both Elvis' and Rick Nelson's paths crossed so many times that Elvis is also a key figure in this story. 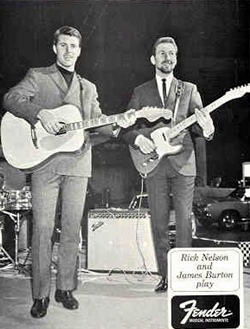 Rick Nelson / James Burton Introduction. For Elvis fans who might not be aware, Rick Nelson first broke onto the national scene as one of the stars of The Adventures of Ozzie and Harriet, a US sitcom based on his actual family, including his older brother, David, his mother, Harriet, and his father, the brilliant genius behind it all, Ozzie. By the time he was seventeen, Rick's musical idol, Elvis Presley, was taking the nation by storm, so Rick decided that he also wanted to be a rock and roll star. Immediately, his first single, a cover of Fats Domino's ‘I'm Walkin', reached #4 on Billboard's Pop Chart, no doubt helped immensely by a performance on an episode of Adventures. 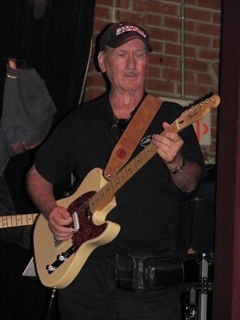 Rick quickly realized he needed a talented band to convey his musical vision, and within a few months, James Burton of Shreveport, Louisiana, became Rick’s lead guitar player. Only seventeen years old, the same age as Rick, James Burton had already contributed one of the greatest solos on record to Dale Hawkins’ "Suzie Q," backed up scores of artists on the Louisiana Hayride, and subsequently joined country/rockabilly star Bob Luman. James remained with Rick for a decade, and their music includes such classic singles as "It’s Late," "You Are The Only One," "Travelin’ Man," "Hello Mary Lou," "Teenage Idol," "Fools Rush In," "There’s Nothing I Can Say," "Your Kind of Lovin," and "You Just Can’t Quit." 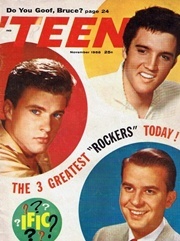 Fifty-three Rick Nelson singles reached the Billboard Pop 100 chart, with five more doing well on the Country and Adult Contemporary charts, respectively. 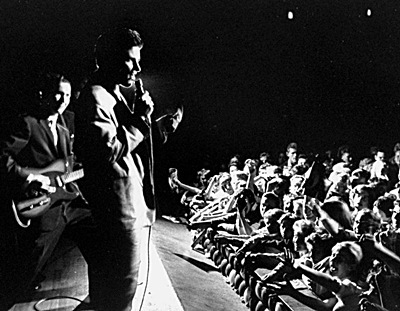 Rick had his greatest success between 1957 and 1963, and during those years he was second only to Elvis Presley, an amazing achievement. As the 1960s progressed, Rick’s commercial fortunes dwindled, yet he refused to quit, instead forging a blazing path that led to the formation of country rock, with albums such as Bright Lights and Country Music, Rick Nelson In Concert, Rick Sings Nelson, and Windfall illuminating his songwriting and musical prowess. After years of constant, gruelling touring, and running away from his early success, Rick returned to his rockabilly roots by the dawn of the early 1980s, forming a new band led by guitarist Bobby Neal, drummer Ricky Intveld, pianist Andy Chapin, and bassist Patrick Woodward. A new record contract with Curb Records was being finalized on the day Rick and his band passed away, and we’ll never know what might have been. 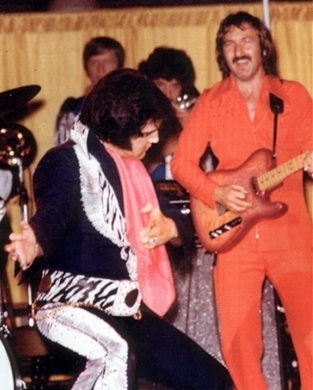 After leaving Rick, James Burton became a huge fixture on the L.A. music session scene, playing on thousands of recordings and eventually joining Elvis’ band in 1969, staying with The King of Rock and Roll until his death in 1977. Later, the guitarist had long tenures with John Denver and Jerry Lee Lewis, eventually becoming a member of The Rock and Roll Hall of Fame in the Sidemen Category. James Burton is rarely interviewed in-depth but kindly agreed to an extensive conversation recalling his time with the legendary Rick Nelson, as well as thoughts on Elvis. Q: Before we dive in, should it be "Ricky" or "Rick?" James Burton: Oh, tricky Ricky, he always went by Rick, although during the early run of The Adventures of Ozzie & Harriet, he was "Ricky". Regardless, being called "Rick" was his choice. 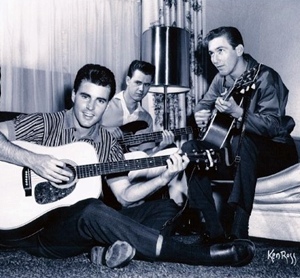 Q: How did Rick Nelson enter your life in summer 1957? James Burton: I was working with a guy named Bob Luman, who was on Imperial Records, the same record label as Rick. 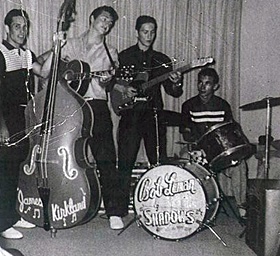 Bob’s group was called The Shadows, with James Kirkland on bass. We were in Hollywood, Calif., rehearsing a song called "Red Hot," a Billy Lee Riley song. Anyway, Rick came in on business and said, "I hear music in the next room. Who is that?" Chudd and Haskell replied, "That’s Bob Luman & The Shadows from Louisiana," so Rick then inquired, "Would you mind if I go in and say hello and listen to ‘em a little bit?" They said, "Nah, go on in." So Rick came in and listened to us play for about three hours, and we just had a great time. We had a home out in the valley in Tarzana, out in Canoga Park, so the next day James Kirkland jumped up and ran outside to get the newspaper. When he came back inside, he noticed a telegram hanging on the door, so he grabbed it and brought it in. It was from Rick Nelson, who had invited me over to the General Service Studios. Rick recommended we bring our instruments, so James and I immediately went over and met his mother and dad, along with everybody involved with the show. Later, we were in one of those little bungalows, setting up and playing, when Ozzie, Harriet, David, Wally (portrayed by actor Skip Young), and all the gang came over. We met them and we played a little bit for them, and Ozzie loved it. He said, "Do you boys wanna do something on the TV show, maybe do a couple of songs?" Everybody said, "Yeah, sure, why not?" This was actually before I joined Rick as his lead guitar player. We did a few shows and had a great time. Rick turned out to be a great guy to be around and play music with. Ozzie wanted to film a lot more songs and show-related stuff, but we got homesick and wanted to return to Louisiana and be home for the Christmas holidays. Ozzie offered us a lot more money to stay over and do the shows, but we said, "No, we wanna go home." So that’s what we did. I was home maybe two weeks, and I got a phone call from Ozzie. He invited me to come back and be Rick’s lead guitar player, which I thought was pretty cool. Ozzie said, "If you accept it, I’ll send you a telegram, just sign the telegram and send it back to me." Rick got on the phone and we talked for an hour or two. He wanted me to come out the next day (laughing), I said, "Wait a minute! I’ve gotta make arrangements and get all my stuff together here." I was only eighteen years old and I’m leaving home, you know. I lived with Rick for the first year or two we worked together, and the Nelson family invited me into their home up in Camino Palmero in Hollywood. Q; How did Bob Luman take the news of your impending exit? James Burton: Bob was happy for us, he was happy for me, that Rick was interested in hiring me to be his guitar player. He wasn’t really thrilled about it, but Bob was happy for us. He said, "Boys, that’s a great thing, I wish I could offer you more." But Bob was a great guy to work with and a great talent. We were young and things were going fast, with a lot of things happening. Bob gave us his blessing and said, "Boys, I’m gonna miss you." James Burton - On Elvis recording ‘Susie Q’ and ‘Fools Rush In’. James Burton: I suggested ‘Fools Rush In’, that was my fault! Well that song was one, also ‘Susie-Q’ and another song, remember ‘Early Morning Rain’? Well Chip Young and I were just sitting in Studio B and playing around with the melody and both on acoustic guitars. Elvis came in and said, "What is that?" and then he started humming the melody and started remembering the words. He says "Hey, let’s record that! Turn the machines on boys!" It was the same thing with ‘Fools Rush In.’ Just too bad I didn’t write 3 or 4 songs to get him to sing! Q: Tell us a little about Rick’s personality. James Burton: Rick was a wonderful, great guy, quiet, and sorta on the shy side. But he was the type of guy that once you got to know him, you understood more about his personality. If you met him for the first time, your impression would be, ‘Boy, this guy is really quiet and shy’. There were just certain things you couldn’t talk about, he was easy to blush, a lot of times when I’ve done interviews, people would ask, "How come Rick closes his eyes when he sings?" Well, I think a lot of it is in feeling, because he had a great feel for the type of songs he sang and what he enjoyed singing, as well as a soft, smooth voice. Rick could sing a lot of different styles of music. We did a lot of old ballad stuff, like "Fools Rush In," which we hopped up a little bit, instead of one carburetor, we had three carburetors on it [Author’s Note: Burton later suggested Elvis record it in May 1971 in Nashville, which he promptly did after running through 25 takes of it]. It just seems like our music really went together well and I think we were a good team. We worked closely, and we made some really nice music in our time span. I think Rick’s music is still very popular, and it’s just as good today as the day we recorded it. James Burton: We talked about some of the old times. Elvis told us some stories about him riding motorcycles. One time he was riding this bike and it had been raining. There were some kids standing around and so he was showing off a little. He wasn't really watching what he was doing and the streets were wet. He turned his head and wasn't watching in front of him and by the time he turned around there was a car stopped right in front of him. He hit the brakes and slid right under the car. He was laid out for a few minutes and then he got up laughing. Nothing happened but he said he was scared later when the whole thing hit him. Q: What was your first official session with Rick? 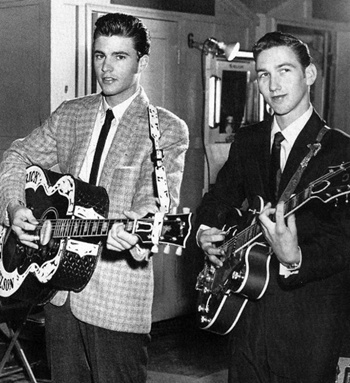 James Burton: Before I joined Rick, Howard Roberts, Joe Maphis, and Barney Kessel were the lead guitarists. The first session I did with Rick was for the "Stood Up" / "Waitin’ in School" single. The drummer was Earl Palmer, a big guy who passed away in September 2008. [Author’s Note: This iconic drummer was later inducted into The Rock and Roll Hall of Fame]. Q: Is it true Elvis’ original band, namely guitarist Scotty Moore and bassist Bill Black, auditioned for Rick just before he met you? James Burton: Rick told me that story after I went to work with him. [Author’s Note: During the first week of September 1957, Scotty and Bill resigned from Elvis over Colonel Parker’s interference in financial matters]. When Rick was looking to put a band together, Scotty and Bill were looking for a job, and they had contacted Rick and Ozzie. So they met and went in the studio for a short time. I believe drummer D.J. Fontana and The Jordanaires were also present. Evidently, it wasn’t what Rick was looking for, or Rick didn’t want to upset Elvis by hiring them. They’re all excellent musicians, but Rick must have wanted something a bit different, it’s difficult to know for sure. It all worked out in the end. [Author’s Note: The Jordanaires started doing backup vocals on the majority of Rick’s hit singles, beginning with "Poor Little Fool" in April 1958. Their name never appeared on Rick’s records at that time, but any listener could easily detect their classic sound]. Q: Were Rick and Elvis similar in any aspects? 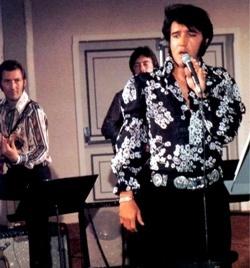 James Burton: Well, they were different; at one time Elvis was always number one, and Rick got up to number two. I think that’s pretty damn good. Anytime somebody can run neck and neck with Elvis, that’s pretty damn close. They were also good friends; they played football, baseball, and softball together. 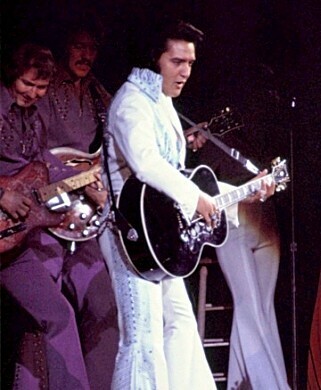 I didn’t actually meet Elvis until 1969, when I put the TCB Band together for him. Rick and I went out and played shows, sold out 30,000 and 40,000-seaters. We played Steel Pier at Atlantic City five years in a row to incredible audiences, we would play six or seven shows a day, we would come on and do twenty minutes, then Les Brown’s orchestra would play twenty minutes, Bobby Rydell, Jimmy Clanton, Dion & The Belmonts, groups like that coming in every twenty minutes. We went through 300,000 people a day doing shows, it was just incredible. We were traveling doing sold-out tours just like Elvis, and the screaming kids would yell, "Run over me, Ricky! Please, please, I love you, I love you!" You know how some of the die-hard fans can be, they’d just as soon have Rick or Elvis run over ‘em in a car, they don’t care. 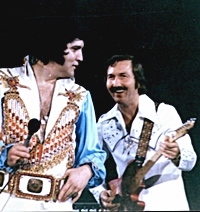 James Burton: Before I met him I've always had the feeling that Elvis might be a little . . . with his prestige and everything . . . well, I had the feeling that he would be the kind of person that you would have to really get to know. But my attitude really changed after I met him, because the guy is so down to earth. He'll talk to anybody. He just loves people and he could just talk to people for hours. At that first rehearsal with him, he came in and we shook hands and talked like we'd known each other for years. It was nothing like "let's get acquainted" or anything like that. It happened so quick I couldn't believe it. Q: Did any of those die-hard fans think you were Rick? James Burton: I remember one time in San Diego we went up and played this ballpark and these fans were crazy, man. We had this truck bed at the pitcher’s base where the stage was set up, and the fans were a little-ways away. I guess they stood about everything they could, they were dying to get over that fence and come and attack us. Going back a bit, we had these little trailers at the back of the stage where we could hang out, get dressed, and keep our instrument cases. We were onstage, and boy, here they come. Our management hollered, "Get off the stage, get off the stage, go get in the limousine!" I unplugged my guitar, and I had to run to my trailer and throw my guitar in its case. I came out of my dressing room, and I got caught in the middle of those screaming fans. They were tearing my jacket off, my shirt, they just wanted to rip my head off, they didn’t know what they were doing, and it was downright scary. I was trying to make it to the limousine; well, the security guys came back to get me, they grabbed me and my guitar and threw me in the car to get away from the fans. They were trying to tear the car up, turn it over, but we managed to get out alive. If you think about being in a position like that, not realizing how dangerous and scary it is, you hear stories where people go to these shows with 60,000-seaters, and people out there go nuts. They have riots, folks are stomped, trampled, or even killed. We went through all that with Rick, and a little more of it with Elvis. We played in Australia in 1959; we were also present in Hawaii that year during the ceremony establishing Hawaii as the 50th state. Rick and I stayed at the Royal Hawaiian Village Hotel, the famous hotel there, and Ozzie and Harriet and everybody came over to join us. We also played London, and the crowds were just as wild over there. They loved Rick, and it was great. James Burton - About Elvis touring in the old days. 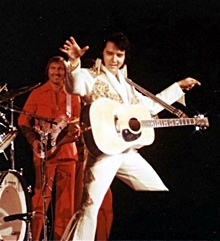 James Burton: Elvis was telling us about one show he did in the fifties that the audience turned the stage over! It was very exciting. 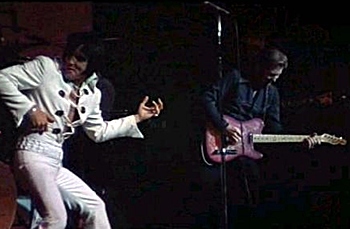 Elvis remembered the policemen were dragging him off the stage and he still had the mike in his hand and was trying to sing. And as they dragged him off-stage, some 10.000 kids were turning the stage over. Q: What are some of your favorite Rick Nelson recordings? James Burton: Probably my two favorite Rick Nelson songs are "Travelin’ Man" and "Hello Mary Lou." If you can believe it, those two songs were the "A" and "B" side of the same single, respectively. An obscure one is "The Nearness of You," a really cool standard on the Rick Nelson Sings "For You" album in December 1963. "Lonesome Town," that’s one I love, which I played acoustic guitar on. "That’s All," a fine ballad from June ’59, remember that one? Q: Did Rick ever tell you what to play? 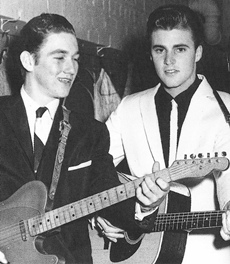 James Burton: Oh no, Rick and I pretty much worked the songs up, and we would put our ideas together. I would tell Rick what I liked and vice versa. We had a good music arranger in Jimmie Haskell, who worked very closely with us. We would tell him what we wanted, and that was cool. I remember Jimmie wrote my solo down for "Hello Mary Lou." He said this is what it looks like on paper, and I said, "Oh wow, looks like a bunch of blackbirds on a fence." Q: Was Ozzie a major guiding force while you were recording? James Burton: Not really, Ozzie would come in and be interested in the song selection. Ozzie occasionally would pick an old standard like "The Nearness of You" or some ballad. Sometimes he suggested to Rick how to sing it, but we would usually end up doing it the way Rick wanted to do it. Rick appreciated his dad’s opinion and ideas, but Rick thought that to do the type of music he really wanted to do, he didn’t want to get too close to his dad’s big band sound. Matter of fact, when we recorded the solo for "Fools Rush In," Ozzie came to me, and he said, "Boy, that solo you played was so good, man, that reminded me of a solo my saxophone player would play in my old orchestra." I don’t think I made a remark, maybe I was thinking it would be cool to say, "Gee, that sax player had pretty good taste." But Ozzie was a brilliant music man and a great producer. Q: Rick’s hit singles started drying up by mid 1964 as the British Invasion exploded ("The Very Thought of You" was his last Top 40 hit until Dylan’s "She Belongs To Me" in 1969), and you were asked to perform on Shindig. Can you talk about that era a bit? James Burton: I worked with Rick exclusively through late summer 1964, until I devoted more of my time to the music variety series Shindig [Author’s Note: the first prime-time rock music show featuring live performances] on ABC. I still did the occasional tour, including a highly successful one of the Far East (Japan, The Philippines, Taiwan) in April 1966 with Glen Campbell on bass, who also played rhythm acoustic guitar and provided occasional background vocals in the studio with Rick beginning in 1961. James Burton: Johnny Cash called me to play slide dobro with him on the very first pilot show for Shindig. Jack Good, the producer of Shindig, was a big fan of mine, and said, "Oh man, I love all those solos on the Rick Nelson records, and I want you to be on the show every week." I said, "Gee, Jack, what do we do?" He said, "We’ll form this group, and you’ll be called The Shindogs." I said, "Oh, okay." Delaney Bramlett sang and played bass, Joey Cooper played rhythm guitar and sang, Glen D. Hardin (of the TCB Band) on piano, Chuck Blackwell on drums (he came out from Oklahoma with Leon Russell), and myself on lead guitar, so that was The Shindogs, and we did 90 percent of the recording for the show with all the artists that came. 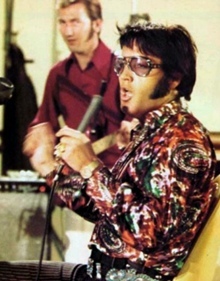 James Burton: At the early rehearsal sessions, Elvis had quite a bit of work to do getting it together, but he was always very relaxed. We always had fun at the rehearsals. We all just did whatever we wanted to do, we worked and we helped each other. Elvis, if he had a song, might sit down at the piano and go through it. He plays the piano. It's very casual. 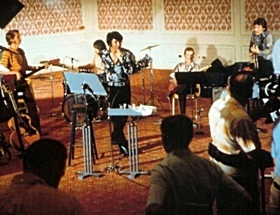 At a big recording session, you have charts, you have an arranger, but at our rehearsals, Elvis just sat and listened to the songs and put them together with the musicians. Q: Are you still in touch with Rick’s original band members? James Burton: Richie Frost moved to Portland, Oregon, and I haven’t seen him in awhile. It’s been a few years since I last talked with him on the phone. I don’t see James Kirkland too much, either; he lives in a little town outside of Dallas. James’ replacement, Joe Osborn, lives about fifteen minutes away from me in a little town. I see him every now and then; I’ve just been real busy lately. Rick Nelson was such a great artist, he could have done anything. The fans really loved him so much, and they would have bought anything he did. It would have been the same as Elvis; whatever suited Elvis, the fans bought it, and this should have happened in a similar manner with Rick. Q: Did you consider rejoining Rick’s band at any point? James Burton: When I actually left to do Shindig, which stayed on for a year, I got so busy, I was doing five, six sessions per day, seven days a week, working with every artist you can think of. I had to make a tough decision to go with Elvis when he called and asked me to put a band together and go to Vegas with him, because I didn’t want to lose all my clients. It worked out, I didn’t actually lose anything, and I gained another wonderful person to work with doing live shows. Elvis was an incredible person to work with. I also worked with Jerry Lee Lewis after Elvis’ death. We were at the Sahara Hotel in Las Vegas on New Year’s Eve 1984. Rick opened the show, and we closed the show, and we would do another set of shows that same night. They weren’t very long, probably 45-minute shows. That was exactly a year before Rick died in a plane crash in De Kalb, Texas, very close to my hometown in Shreveport. Rick and I spent two great weeks together, talking, visiting, just hanging out. We were always friends and very close. Q: Did you get onstage with Rick during that engagement? James Burton: No, actually I didn’t, because Rick would do his show first and Jerry Lee’s band would never be backstage until maybe Rick’s closing number. Once in awhile, I would go down early and hang out. You know, we could have done that, but we didn’t. I don’t know if Jerry Lee would have liked that, it would be like working with Elvis, you wouldn’t want to go onstage with somebody before Elvis’ show, it wouldn’t look good. That could have happened, though. Q: Where were you when you received the news of Rick’s plane crash? James Burton: My wife, Louise, and I had a home in Las Vegas since I had worked with Elvis so long, and we had went to Vegas during that weekend in 1985 for New Year’s Eve. My son’s ex-wife called to tell us the news, but I didn’t take the call. I answered the phone and gave it to my wife; she took the call, and I heard her scream. I ran back into the room, and I said "What happened?" Louise said, "Turn the TV on, Rick and his entire band just had a plane crash!" That’s how I found out about it. It was such an incredible shock, and we lost a wonderful, great entertainer and friend. The whole band, including road manager Donald Clark Russell, guitarist Bobby Neal, bassist Patrick Woodward, drummer Ricky Intveld, and keyboardist Andy Chapin, they were all good friends of mine. It was such a sad time for us, being there and thinking of the year before, what might have been, and what a great guy Rick was, just being that close to him. When you lose somebody that close, they’re like family to you. Q: Do you still stay in touch with Rick’s family? James Burton: Oh yeah, absolutely. Rick’s two sons, Gunnar and Matthew, performed at the very first James Burton International Guitar Festival in 2005. We’re the best of friends, the whole family as well as Rick’s kids. Does it register that 25 years have passed since Rick left us so soon at the early age of 45? It doesn’t seem like it’s been 25 years at all. I think about him so often. When I go out and do shows, those songs, like "Hello Mary Lou" and "Travelin’ Man," even "Mystery Train" and "I Got A Woman" (Elvis also had hit versions with the latter two), all those old tunes are top of the line. Rick was a talented individual who had a wonderful, great career. All the music we did is just as good today as when we recorded it. Rick was on the verge of being a real gigantic superstar. I think he actually became that. Above all, I miss him. I think he was one of the sweetest, finest guys I’ve ever worked with, and the whole family is unbelievably fantastic. He loved his kids, boy I tell you, his youngest child, Sam, is a great singer, too. Q: What would you like to say to Rick’s many worldwide fans? James Burton: Tell all the Rick Nelson and Elvis fans hello, and God Bless each and every one of them. I truly miss Rick, and I hope to continue doing great work with his kids: Tracy, Gunnar, Matthew, and Sam. NOTE - This is an edited version of a lengthy and fascinating interview - To read the complete interview with even more historical photos and Rick Nelson stories - Click Here. -Copyright EIN April 2011 - DO NOT COPY. GO HERE to the Official James Burton website - full of current news and James Burton information.